This weekend the Romanian Fed Cup team grabbed a historic 3-2 away win over the Czech Republic in Ostrava, and will play France in the competition’s semi-finals due in April. On Sunday, the balance tipped in favor of Romania who won thanks to the outstanding performance of the pair made up of Irina Begu and Monica Niculescu who won against the best-ranked women’s pair, Barbora Krejcikova and Katerina Siniakova, 6-7, 6-4, 6-4, at the end of nearly three hours of play. After the game, Irina Begu told us how much this win means to her: “It’s a huge achievement. To me, to the team, it is a victory we very much desired, but at the same time we didn’t think we could win, considering we were playing away from home against the title holders. However, overall I’m very happy and glad to have pulled off this win. I believe it was better that we lost the first set, because this helped us play our normal game. The win has given everyone a morale boost. It’s a wonderful feeling playing for your country and the array of feelings you experience is very different compared to WTA tournaments”. The best-ranked Romanian tennis player, Simona Halp, was the undisputed leader of the team, winning two singles matches. For the seventh time in her career Halep defeated the Czech team’s power player Karolina Pliskova, 5th WTA, at the end of three sets, 6-4, 5-7, 6-4. After the game Halep said the win against Pliskova is the most important win on her Fed Cup record sheet. Previously, on Saturday, Halep had eased past Katerina Siniakova (44th WTA), in straight sets, 6-4, 6-0. Simona Halep: “This a tremendous win for me. I’ve never experienced such joy. It was unbelievable we won 3-2, on their home turf. I’ve given my best on court and we are very happy we eventually won”. Unfortunately, Mihaela Buzarnescu, 29 WTA, lost in both of her singles matches, 6-4, 6-2 against Katerina Siniakova on Sunday, and 6-1, 6-4 against Karolina Pliskova on Saturday. The international media has praised the achievement of the Romanian Fed Cup team, particularly the feat of the doubles pair Begu-Niculescu. 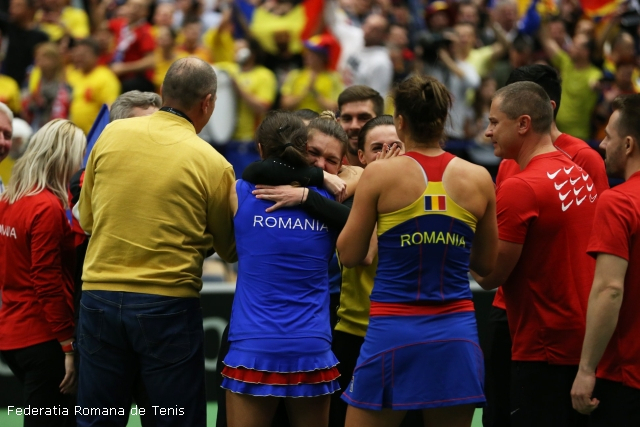 “Romania reached their first Fed Cup World Group semi-final with a thrilling 3-2 win over defending champions and hosts the Czech Republic in Ostrava”, BBC Sports writes.